Moog's Integrated Hydraulic Manifold Systems are fully self-contained systems comprised of hydraulic manifolds, cartridge valves, and servo cartridge valves. Designed and built for each customer's application, the circuit logic and functionality of the manifold is engineered to meet exact performance, safety and mounting requirements. Moog is the expert in providing high performance, reliable cartridge and servo cartridge valves with advanced safety functionality that are matched ideally to the needs of the system. Moog's custom approach to manifold design allows for a wide variety of machine control solutions for challenging applications such as metal forming and die casting machines. Our systems offer many advantages including reduced size, weight, and cost and are known as a cleaner, leak-free and more reliable solution. 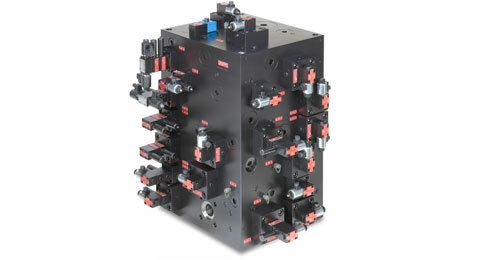 The fully integrated features of our integrated hydraulic manifold systems make for easy installation. Gone are the sub plate manifolds, hard or flexible piping, connectors, and clamps formerly known with traditional distribution systems.